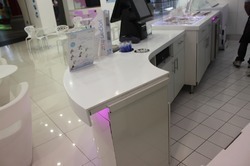 In order to keep pace with never ending demands of clients, our company offers Crystal Solid Surface. 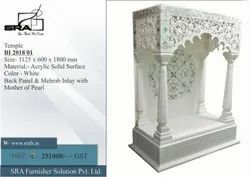 n order to keep pace with never ending demands of clients, our company offers Crystal Solid Surface. These Hanex Corian Solid Surface beautify various decors with their pretty designs and patterns. Furthermore, these flooring come with guarantee and can be keep a touch up later on, if required. Useful for white marble like Thassos & Satuoria. You can mix white colouring paste to make the joints/filling white in colour. Kapri Stone Products Pvt. Ltd.